With the morning withdrawal of Supasundae and the late defection of Samcro, former champion hurdler Faugheen appeared to face a straightforward task. Ruby Walsh set out to make all on 2-5 shot Faugheen, who was last seen winning over three miles at Punchestown and was dropping back to two this time. Just when Faugheen looked set to go clear though, Sharjah, a Galway Hurdle winner but beaten behind Bedrock and Samcro at Down Royal, cruised past him. Paul Townend rode the 7-2 shot out to win by seven and a half lengths. Townend said: “That was pretty straightforward for a Grade One. “I travelled well the whole way, got the feeling Ruby was in a bit of trouble when I was still doing it well and I had fitness on my side. Both Sharjah and Faugheen are owned by Rich Ricci. Mullins said: “The other two took each other on in front and maybe galloped each other into the ground. Paul took advantage of that. “He wants a sharp two miles. He’s done a lot for the season and I don’t know if I’m going to go on with him now or not. “I may give him a little break and come back in the spring, but after doing that today, it looks like we’ll have to go to Christmas (Leopardstown) with him. “We’ll see how he is when he comes out of this race. He’s had no break between Flat racing and the Galway Hurdle and everything. “Paul said he came alive going down the back stretch today and he thought that far out that he had a great chance of winning. 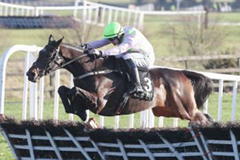 Of Faugheen, Mullins added: “Faugheen missed two or three hurdles. I would have expected him to find a bit more, but he didn’t. The two in front just collapsed. The Morgiana Hurdle was formerly contested over 2½ miles, and for a period it was classed at Listed level. It was cut by 2 furlongs in 1992, and it was given Grade 2 status in 1994. The race was shortened to its present length in 1995 and was promoted to Grade 1 level in 2006. Previous sponsors of the Morgiana Hurdle have included Ballymore Properties, Maplewood Developments, Dobbins & Madigans and Ladbrokes.